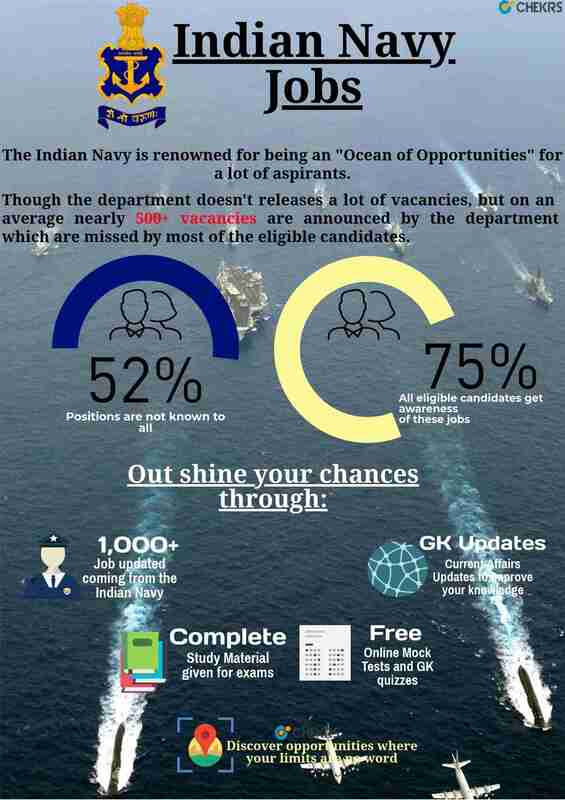 Aspiring to join the Indian Navy? If yes then you don’t need to search Navy Opportunities here and there. At Chekrs, at a time you can get exposure to multiple Indian Navy Career 2019 options to evaluate what is best. The Indian Navy is among one of the strongest department providing a secured future to all. Aspirants who have been looking forward to enrolling themselves in Indian Navy Vacancy can choose their right career option with Chekrs. Here we provide you on the click results so that you can know each Indian Navy Govt Jobs 2019 and apply for them as per your convenience. Moreover, as you are interested to know Indian Navy Bharti that are well paid, here we present to you in the simplest manner. The Indian Navy Jobs 2019 has a very promising future. Not every position suits to every group. Thus we provide the updates of Indian Navy Jobs for Female, Engineers, Diploma Holders, for 10th pass etc. Also if your interest is to work at any place of your choice while accessing our website you can easily filter the options from Indian Navy Jobs in Mumbai, Goa, Kochi, Vizag, etc. Why Chekrs for Latest Navy Jobs? We are rooted with the main aim to provide you complete assistance that can be useful for you. We aim to be there for you until the complete selection process is over. Art Chekrs you can find complete aid to download and access the study material comprising of previous papers, model papers, and online mock tests.